15 Breathtaking Mehendi Decor Ideas which are better than your pinterest pins! A Mehendi ceremony is the highlight of a big-fat Indian wedding. It’s a colourful event with loads of music, dance and henna (of course) where you put your hair down and have fun. It also calls for for the decor to be on point because apart from a lot of pictures being taken around it, the decor also sets the right mood for the ceremony. This bright pink decor with the bird’s backdrop and careful selection of flowers is grabbing all the eyeballs for all the right reasons. 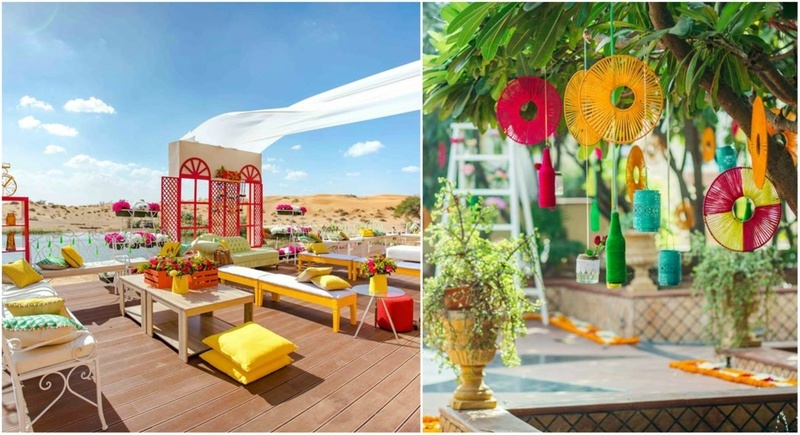 Ever dreamt of hosting your mehendi ceremony in the middle of a desert with a breathtaking view? Well, then there’s some major inspiration for the same with this decor consisting of bright props complementing the backdrop. Who says you can’t have your mehendi at a beach? Your mehendi, your rules! If you still feel people don’t get the drill, put up an alphabetical signboard. This excessive use of tassels in the mehendi decor while playing with different shades of pink makes it a sight for sore eyes. A poolside mehendi using bright clothes, colours and interesting props serve as a very interesting setup. We love how this mehendi decor has an added element of drama with the fairy lights. This mehendi decor comprising of huge dreams catchers, interesting props, with the initials of the bride and groom’s names looks to have popped right out pinterest. We are totally in love with this mehendi decor that has this couple’s cute and candid pictures of themselves and their families. This mehendi ceremony held poolside at a palace with the fairy lights in the backdrop, gives a very royal feel to it. . This colourful decor using different clothes and drapes sets the much-needed vibrant mood for a mehendi ceremony. If you are looking for a mehendi theme which is totally out-of-the-box, then you have to consider this Bandra railway station themed set-up. If ‘work hard and party-harder’ is literally your motto, 20’s fashion is totally your style or you are a big fan of Leonardo Di Caprio (who isn't), you know what’s going to be your Mehendi theme. This mehendi decor is giving us major boho vibes with it’s colourful and playful props. These colourful umbrellas with intricate detailing and mirror work on them are definitely decor goals. Yes, we know you are thanking us right now for putting up the best and coolest mehendi decor themes and you’re welcome!